This allows us to perform a systemwide installation of the JDK for all users and requires root access. RPM-based Linux platforms are based on Red Hat and SuSE. In this tutorial, we are getting through both of processes to install Java 9 on CentOS, RHEL. 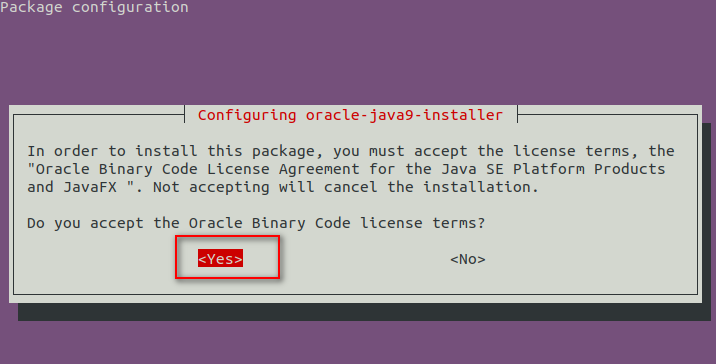 And if you’re looking for guidelines how to install Oracle Java 9 on Ubuntu, please read the instruction at Install Oracle Java 9 on Ubuntu 16.04 LTS (Xenial Xerus). Because there is only one version of Java in our environment, we only see one record. If we have more versions of Java, they will be listed out and we can select the active version by input the number accordingly. We can configure the same for other Java commands such as javac, javadoc, javap. And that were all steps to install Java 9 on CentOS, RHEL. You must log in as a root user to install Java 9 on CentOS, RHEL from a RPM package. We can see that there are two versions of Java in our environment. And if we want to change the default one, we can input the number accordingly to the terminal. The tutorial has illustrated us two different ways to install Oracle Java 9 on CentOS, RHEL and we can see that using the RPM process seem to be more simple and is suitable for performing a systemwide installation of the JDK for all users as well. In this tutorial, we’re going to learn how to install Cassandra on Ubuntu 16.04 both of approaches. The latest version of Java 8, either the Oracle Java Standard Edition 8 or OpenJDK 8. We’ll install Cassandra from Debian packages distributed by Apache repository of Cassandra, therefore we will need to add the repository to /etc/apt/sources.list.d/cassandra.sources.list. Let’s see the following command which will add the repository of Cassandra 3.9, the latest version of Cassandra currently. Issue the following command to install Cassandra and wait for a moment. We can download the latest stable release from the Apache Cassandra downloads website. For example, the following command will download the Cassandra 3.9 from the website. Next, we will change permissions on of the directory in which Cassandra can be stored its data. Save the file and quit nano. See the cqlsh section for full documentation. We have just gotten through how to install Cassandra on Ubuntu 16.04 from both Debian package and from Tarball files. Both of approaches are simple and you can choose any that is suitable for you. If you want to take control of everything, you can try with the Tarball files. However, if you prefer apt-get, you can try with the Debian package. This short tutorial is going to cover how to install Packer on Ubuntu 16.04 so that you can get started with exploring many great features of Packer. Visit the Packer download website to download a suitable version of Packer for your operating system. I’m using Ubuntu 16.04 64 bit, therefore, I’m going to download the 64 bit version of Packer. We have just finished to install Packer on Ubuntu 16.04. This is an initial start so that we can get start to explore more features of Packer in next posts. This tutorial is going to illustrate how to install Hadoop on Ubuntu 16.04 so that you can perform simple operations using Hadoop MapReduce and the Hadoop Distributed File System (HDFS). Local (Standalone) mode: Hadoop is configured to run in a non-distributed mode, as a single Java process. This is useful for debugging. Pseudo-Distributed Mode: Hadoop can be run on a single-node in the pseudo-distributed mode where each Hadoop daemon runs in a separated Java process. Fully-Distributed Mode: Hadoop runs on a fully distributed cluster. In this tutorial, we will get through the first mode, install Hadoop on Ubuntu 16.04 in Standalone mode. The remained modes will be covered in other separated posts. Java must be installed. We’re going to use Java 7. You can find the the recommended Java versions are described at Hadoop Java Versions. Before you can run Hadoop, you need to tell it where Java is located on your system. 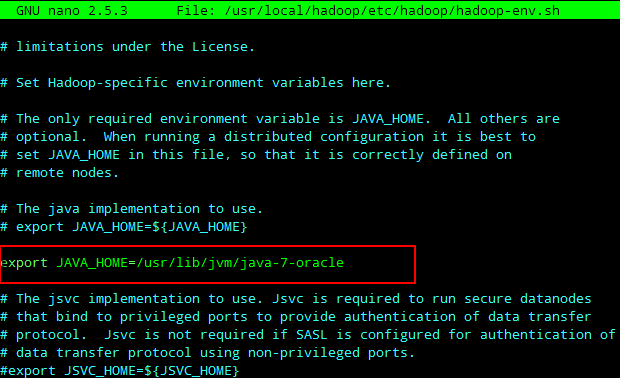 By default, Hadoop is configured to use the JAVA_HOME variable of the system. So, if you have this variable defined and pointed to a suitable Java installation, that will be used and you don’t need to configure it anymore. Otherwise, you have to set the Java installation for Hadoop by editing the etc/hadoop/hadoop-env.sh file in the distribution. Let’s open the /usr/local/hadoop/etc/hadoop/hadoop-env.sh file and change the value of the JAVA_HOME variable to your Java installation. Here is an example which set JAVA_HOME to the /usr/lib/jvm/java-7-oracle folder. We will create an environment variable that points to the Hadoop installation directory and to put the Hadoop binary directories on our command-line path so that we can run the Hadoop command everywhere. This tutorial has just showed you how to install Hadoop on Ubuntu 16.04 in Standalone Mode. As mentioned on the beginning of the tutorial, this mode is useful debugging and for those who just want to get started with Hadoop. If you want to explore fully Hadoop and its ecosystem, you can get to know about Hadoop distribution provided by Cloudera or Hortonworks. In this article, I’d like to share how to install Oracle Java 9 on Ubuntu 16.04. Java 9 will be released on 2017; however, it’s good for anyone who wants to try some new features of Java 9 with the new early access version. If you’re looking for guides how to install Oracle Java 9 on other Linux distros, you can read Install Oracle Java 9 on CentOS, RHEL 7. To install Oracle Java 9 on Ubuntu 16.04, we will need to add the WebUpd8 PPA repository first. We can do that simply by running the following command. The command will list out all the available versions of Java is being installed in our environment and ask us for selecting the default one, and here is an example on my PC. Currently, the default version is the Oracle Java 8. I change to Oracle Java 9 by entering 0. And that is the final step for us to install Java 9 on Ubuntu 16.04 by using apt-get. This section will cover how to install Oracle Java 9 on Ubuntu 16.04 manually from archive binaries. And that is the final step for us to install Java 9 on Ubuntu 16.04. We have tried to install Oracle Java 9 on Ubuntu 16.04. Note that Java 9 has just been released and with the above PPA, we can install the latest release of the Oracle Java 9. 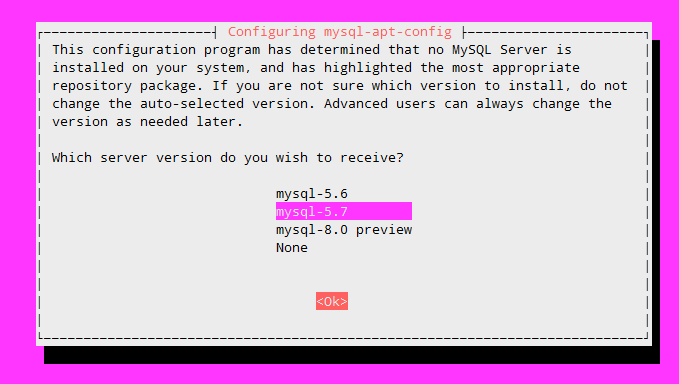 In this article, we try to install MySQL on Ubuntu 16.04 (Xenial Xerus) with APT. 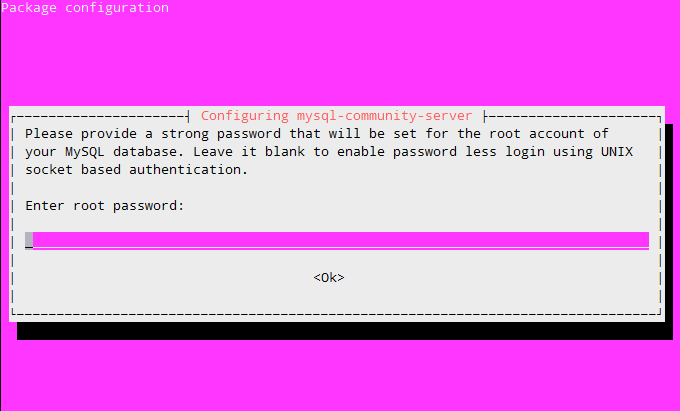 This will allow us to install latest packages of MySQL. In this tutorial, we will download the version 0.8.0-1 which is the latest version of this installation time. Run below command to install the package. 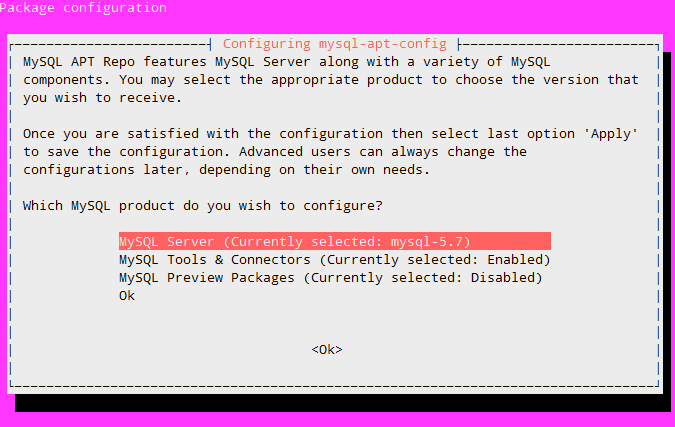 During the installation, you will be asked to choose the versions of the MySQL server and other components that you want to install. 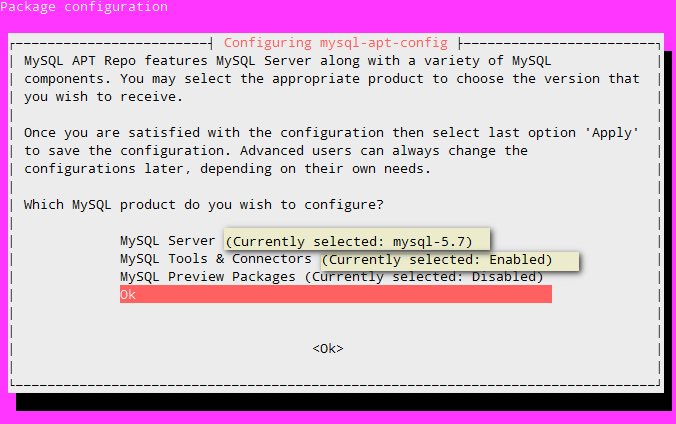 The below popup will show us the selected status of MySQL version and its components (in light yellow color). Select OK and hit Enter to finish. During the installation, we will need to supply a password for the root user. This article will show you how to install Maven on Ubuntu 16.04(Xenial Xerus). There are 3 approaches to install Maven on Ubuntu. We will use apt-get to install Maven on Ubuntu 16.04. This is the simplest way. Apache Maven 3.3.9 Maven home: /usr/share/maven Java version: 1.8.0_101, vendor: Oracle Corporation Java home: /usr/lib/jvm/java-8-oracle/jre Default locale: en_US, platform encoding: UTF-8 OS name: "linux", version: "4.4.0-36-generic", arch: "amd64", family: "unix"
OS name: "linux", version: "4.4.0-36-generic", arch: "amd64", family: "unix"
You can download Maven distribution from the Apache Maven website. Currently, the latest release of Maven is version 3.3.9. SDKMAN is a tool for managing parallel versions of multiple Software Development Kits on most Unix based systems. We can leverage SDKMAN to install Maven on Ubuntu 16.04. Apache Maven 3.3.9 (bb52d8502b132ec0a5a3f4c09453c07478323dc5; 2015-11-10T16:41:47+00:00) Maven home: /home/ubuntu/.sdkman/candidates/maven/current Java version: 1.8.0_101, vendor: Oracle Corporation Java home: /usr/lib/jvm/java-8-oracle/jre Default locale: en_US, platform encoding: UTF-8 OS name: "linux", version: "4.4.0-36-generic", arch: "amd64", family: "unix"